Besides working hard to make their themes Gutenberg compliant, the folks at Genesis have been improving the onboarding experience for new theme owners and a new way for theme developers to easily maintain themes through a new custom API. See what goodies are in their new “joyful experience” updates with version 2.8. The folks at StudioPress just announced that they are “building joyful WordPress experiences that just work” with the release of Genesis 2.8. The base Genesis theme and framework have changed to fully support Gutenberg blocks. That goes way beyond the text editor. They have also incorporated Atomic Blocks from Array Themes in place of widget-ready areas on the home page. You can see a demo of it on my Gutenberg test site. Keep in mind that Genesis itself has always come with a base theme. Most of us don’t use it, nor do the folks at Genesis expect us to. In fact, they will give you a warning that they notice you haven’t installed a child theme yet if you try to do so. And that’s the way Genesis is made to run – with a child theme. So, if you update Genesis, it should not impact your child theme. That’s the beauty and the bane of using child themes. They aren’t affected by WordPress and Genesis updates. But they can’t make use of the new features yet either. The actual child theme has to be updated to take advantage of the new foundation. As I’ve reported in a previous Tips Tuesday, Genesis has already begun updating their top 6 child themes to fully support Gutenberg. For clarification – Genesis became fully Gutenberg compatible months prior to the release of WordPress 5.0, meaning they would not break if you updated WP. However, the child themes did not fully support all Gutenberg-only functions like full width image blocks and such. 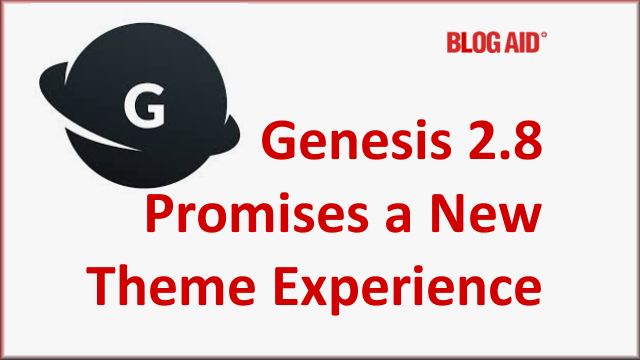 The folks at Genesis will continue to update more child themes and they are also making new themes that are geared toward using Gutenberg blocks to build the home page instead of widget-ready areas. Widget driven home page themes aren’t going anywhere any time soon. I predict it will be around 2020 before we start seeing a mass preference for the newer block driven themes, and then at least another year before that tips into becoming the norm. Back in the summer of 2018 I installed one of the newest StudioPress themes to use as a base for the BlogAid theme revamp. I was stunned at how confusing the process was of creating the home page layout. There was no easy way to do from the limited directions given by the developer. And the so-called easy way included downloading a bunch of recommended plugins and then a slew of demo content. That helped, but there should have been a better way. I beta tested the new Genesis 2.8 theme and the new one-click demo install was a breeze! It filled the home page with Gutenberg blocks and the appropriate content for them. And to my delight, it did not load a bunch of post and page demo content. I have encountered several community themes that are featured on StudioPress that were all over the place in how well they loaded the demo content. Several had issues with plugins and rights to images. I believe it is Genesis’ hope that this new One-Click Demo Install will be adopted by all Genesis child theme designers. That will give some standardization for both designers and users too, which is desperately needed, in my opinion. Don’t count on this new addition being available for your child theme right away. It’s being added over time. And I don’t know yet how it will behave with widget-ready home page type themes, or if it will even be available at all for them. Several child themes already have a demo installer, so I don’t know how they will differ. We’ll see in the next few months. I’ve long said that there needs to be tighter quality control for any themes available via StudioPress, especially those offered by 3rd party design houses. The coding is just too all over the place with some, as is the backend user experience. To help address some of these issues, and to better standardize customization of Gutenberg elements, the folks at Genesis have create the Genesis Configuration API. In theory, this will help end users make use of all kinds of Gutenberg block styling options while retaining the style parameters of their theme. I’m delighted with this news as the big caveat I saw with all the style choices in Gutenberg was the ability for users to make their site look like a circus. And that in turn would cause a lot of in-line styling, which in turn slows down theme page load time. The beauty of a theme is that its CSS (Cascading Style Sheet) is loaded at the beginning and then cached by the browser. That makes all additional page views and return visits to the site load faster. With in-line styling, the individual styles applied have to be read on a per page/post basis. And even though they will be cached by the browser, the next page they visit may have totally different in-line styles. So, the caching is worthless as it doesn’t get called into play. We’ll see what designers/developers do with the new Configuration API and how it plays into site speed. The Genesis 2.8 article didn’t give a lot of detail about what’s in the new Block Style Guide. A few hours after Genesis 2.8 started rolling out to site owners, WPEngine, the new parent company of StudioPress and Genesis, released their own article with the news and more info on the Block Style Guide. “Theme authors can now style blocks and provide users control over those styles in alignment with the design of a particular theme. Editor Color Palette – while WordPress offers a default set of colors, themes can now register their own color palette and if preferable, can lock users into picking from a defined palette. Editor Text Size Palette – themes can now register their own sizes and optionally lock users into picking from a preselected set of sizes. Responsive Embeds – themes must now opt-in to responsive embeds. Front-end and Editor Styles – To get the most out of blocks, theme authors will want to make sure Core styles look good and opt-in, or write their own styles to best fit their theme. One of the hidden, but biggest bonuses to all this is that it streamlines the Genesis code. One of the things I’ve always liked about Genesis is the clean code. In all of my speed tests over the years, just adding Genesis made WordPress run faster too. One of the big complaints about Gutenberg is that it slows down page load. So, I’m crazy anxious to put the new Genesis code to a series of speed tests to see if it indeed still speeds up WordPress, and especially Gutenberg. Even more changes are coming to Genesis, and from the early reports I have seen, most all of it is around Gutenberg and continuing to make the type of improvements we see in 2.8. While there are no timelines given for the coming updates, the Genesis team has been on a bullet train with this project and I expect we won’t have to wait too long to see more theme and core updates. Is it Safe to Update to Genesis 2.8? I believe you won’t even see any changes if you are not using Gutenberg. I’ve been running the Genesis 2.8 beta for a couple of weeks on my Gutenberg test site and the only issues I saw were from bugs in WordPress 5.0.2 that have been all resolved with the release of 5.0.3. But, there are so many variables if you are running Gutenberg, and using Gutenberg specific features with plugins, that I can’t say for certain if folks running under those conditions will see no issues. As always, take a full backup first. Are you using Gutenberg yet, or do you plan to in the next 6 months? I’m chomping at the bit to switch over on my woodworking site, including a full theme revamp. And I’m hanging out for just a wee bit longer before switching over BlogAid, as I want to see what else is in store in the next few weeks with both WordPress and Genesis. But for any new site, I would advise getting on Gutenberg and one of the already updated Genesis themes today. Another very informative post, MaAnna. The glimpse into the future I see a great help to me and my site co-owner as we plan for the next 2-3 years. Thank you. Thanks MaAnna for the great article. You have confirmed what I read and understood with the Studio Press article. I am very comfortable updating on my clone now and using on my live site in a few days. I can’t wait to see what my theme will offer. This info is another reason I discourage bloggers from using fly by night themes. There is just too much to lose in security, quality and speed. I would hate to lose my blog over a few well spent dollars! I’m about to update most of my sites to Genesis 2.8 today. But, I’ll be running a bunch more speed tests and such before I’m ready to switch BlogAid over to Gute. I want to get a baseline before I make any changes to Genesis or Gute and see how each change affects the speed. I am holding off on Gute until my theme gets further on board. I am not about to keep changing fonts and colors for text. Too hard to find! There have been 4 theme releases this year!